The financial-advice industry is being challenged - for the best. Full disclosure: I'm an optimistic person. I never lose my keys, for example, although sometimes I just can't find them for a few days. My optimism extends to my view on where our industry is heading in terms of delivering high-quality financial advice--things are looking up! Tricia Rothschild, CFA, is the director of Morningstar's securities research business. She defines and manages the business strategy for the firm's equity, mutual fund, closed-end fund and ETF research. She began her career as a closed-end fund analyst and later became the international editor of Morningstar Mutual Funds. She has a master's degree from Indiana University. But unlike my personal optimism, which admittedly could be seen as avoiding raw reality (I do end up needing to replace my “not lost” keys at least once a year), my optimism in the state of financial advice is justified. The industry is demonstrably stronger now than it's ever been. There are three key reasons for why I believe this. First, the bar has been raised for all of us to deliver comprehensive--and comprehensible--low-cost financial solutions to investors of varying wealth levels. Just like the advent of mutual funds brought Wall Street to Main Street, the emergence of automated advice solutions (aka robo-advice) is bringing lower-cost, user-friendly investment portfolios to people who would never pick the word investor out of a list of possible personal attributes. Second, those of us who are engaged in delivering professional financial services to individuals have more tools than ever at our disposal. No need to key in data by hand from multiple statements, or have an assistant re-enter client names, phone numbers, and birthdays from a financial-planning software application to a client-proposal software tool. 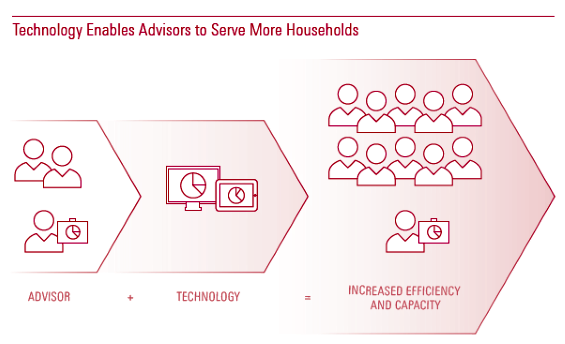 Even as fee pressure increases, a suite of well-integrated technology solutions can deliver efficiency gains and increase advisors' ability to handle significantly more households, which can more than offset the losses from fee compression. Third, regulatory trends in most global markets are bringing the investor to the forefront of the financial equation. In both the U.S. and Canada there have been extensive discussions in the past year over issues related to addressing conflicts of interest and adopting a best-interest standard. Looking back over the past 20 years that I've been in the industry, even optimists like me should have been at least somewhat skeptical. Because despite the investor-friendly intention and potential of the mutual-fund movement, the “value stack” has been clearly weighted toward the institution, not the individual. I remember being a young mutual-fund analyst in the mid-1990s when I first heard someone in the industry refer to a mutual fund as a product. The term was appalling to me and my colleagues. A mutual fund is not a tube of toothpaste! But little by little, I started to understand how and why fund manufacturers needed to create products that would sell, that would be differentiated from the competition, and that would attract customers, and it started to seem that maybe the toothpaste analogy was not too far off the mark. And it's true, investing in a vacuum--or selling funds as stand-alone products without regard to actual client portfolios--is clearly easier to measure and get compensated for. It's easier to sell the tube of toothpaste than it is to coach and manage a patient toward a life of good dental hygiene. Yet, thankfully, the value stack of financial advice is shifting. The cost of investment selection, and with it the assumption that most of us are investing in a vacuum, is falling, and the perception that financial planning has value is on the rise. This, I would argue, is well-deserved. This is not to say that investment selection and portfolio selection should be considered commodities, but rather that we are witnessing an important rebalancing of the value proposition, from one that was overly weighted toward the product to one that more fully values other factors, such as high-quality financial advice. It is going to be very hard for many of the largest firms in our industry to adapt to this reality, and I applaud those firms that are trying to reorient their businesses to continue to serve investors in a more holistic way. But I think we need to be honest about the retooling that is required for us to fulfill the opportunity in front of us. This retooling will require at least three things. First, we need to be clear on the skills required. The skills that brought success to a lot of people when investment products were at the core of the value stack are not going to translate to success in the future. The broker of yesterday does not necessarily have the skills or the interest in delivering high-quality financial planning services. It's impressive that one of the largest U.S. brokerages hired a psychologist to sit with each branch of advisors to discuss how the advisors could add value through behavioural coaching and how they could shift the conversation from the investments themselves to the emotions (including fear, ambivalence and anxiety) that investing might provoke. But there is much work to be done to equip advisors with the tools and support they need to have these essential conversations--particularly across generations and genders, and not just with the archaic "head of household." Second, we need to restructure the industry's standard fee and service model so that it is more tailored to the client's need. This means that for people who have a straightforward situation and modest means, 100 basis points per year in fees is probably too high. For people with complex situations and considerable means, 100 basis points may be too low. And for people whose situations are in flux--meaning they are transitioning from simple situations toward the complex end of the spectrum, or vice versa--the successful advisory firm will find a way to meet these folks where they're at and offer a service model to accommodate them. I'm encouraged by the conversations that I've had over the past year with thoughtful independent investment advisors who are revisiting the spectrum of services they provide to meet this reality. Many of the more progressive large firms are also clearly focused on segmenting their client base in a way that is more logical, albeit potentially risky to some of the established fee structures. We can move beyond the one-size-fits-all model of financial advice that we've accepted for so many years and actually begin to provide the right service, at the right price, to the right family members, at the right time. What a concept. Third, we must use data to our advantage. It is both cool and scary to be able to collate and analyze so much data--cohort studies and predictive analytics will undoubtedly influence behaviour for the better. This is true for many industries, not just ours. But due to the privacy and security of financial information--unlike, say, movie preferences or travel recommendations--we need to be very clear on who owns the client's data, who owns the advisor's data, and what rights are associated with these various data sets. Using the client's data to best meet the needs of the client is the fundamental challenge--and promise--of the future of financial planning. 1 Energizing and engaging, not pejorative or painful. 2 As important as high-quality medical care, and worthy of the same level of care and thoroughness. It's not a "loss leader" on the way to selling something else. 3 Delivered by people with skills that are likely to be quite different from those previously fostered and rewarded by our industry's traditional emphasis on investment-product sales. 4 Paid for via a modular fee-for-service pricing model rather than the historical one-size-fits-all pricing model. 5 Backed by solid data that is not generic and readily commoditized, as has traditionally been the norm. Rather, it is gathered from the relevant sources in the investor's life, and thoughtfully analyzed in a way that is uniquely relevant to each client and yields insight and influences behaviour. If we can work together within our industry to bring this kind of positive change to the people who trust us to collaborate with them along their financial journeys, I daresay we might convince a few of the “glass-half-empty” folks to edge toward the “glass-half-full” approach to life. And I'm optimistic about that possibility! This article originally appeared in the June/July 2017 issue of Morningstar magazine.